Easter isn't all about chocolate egg-laying bunnies, it's also about ALL CHOCOLATE! The below are some of our non-egg shaped favourites. I love to make little goody bags for my Easter guests and these all make great additions to an awesome Easter assortment. These may be little bars but they are huge in the taste department! With flavour combinations like Goji & Orange; Maca, Vanilla & Nibs; Maple, Toasted Rice & Pink Salt as well as Coconut & Lucuma these will please and excite even the most demanding of chocolate connoisseurs. Stack all four flavours and tie them with a ribbon for a lovely gift and alternative to the ubiquitous egg, or slip one into a goody bag assortment. 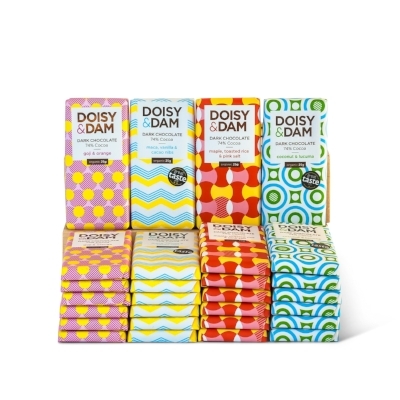 Buy the Doisy & Dam Easter Basket of 21 mini bars and have enough to share with yourself and your guests. These are quite grown up chocolates and not only because they are labelled as 'After Dinner Ginger Thins'. They are the ginger lovers answer to the After Eight and are rich without being too sweet. These are great to put out with coffee after, you guessed it, dinner, or to eat while thinking about what to have for dinner. A handful of these giant buttons will make most things better but I like to add them to my Easter treat bag and also to my mouth. The chocolate is rich, mellow and creamy without being excessively sweet and while it is easy to eat more of these than intended each giant button is intensely satisfying.